Have you ever wondered what it would be like to be the host of a kid’s birthday party or taking a group of young ones to the beach? Before even saying yes, you’ve probably been hit with that crippling fear of having a child get hit by a car, maybe ravaged by seagulls, or even crushed under a pile of cans. Well, developer Fellow Traveller has you covered with Think of the Children, a hilarious take on trying to be a responsible parent in impossible conditions. 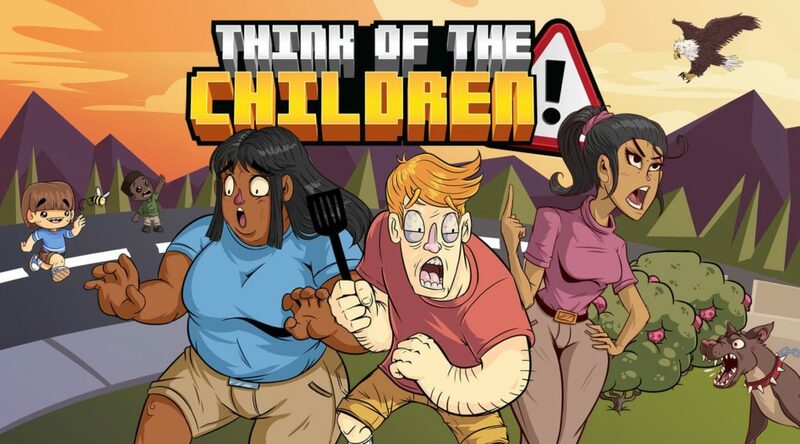 Think of the Children is a co-operative parenting simulator, or at least that’s how the developer is pitching the concept. Your goal is to frantically try to manage hyperactive children who are doing everything possible to put themselves in immediate danger no matter what you do. It’s the type of chaotic multiplayer experience that takes many cues from Overcooked, but sometimes to a much more frustrating degree. The levels in Think of the Children range from more common circumstances like a backyard birthday party or a beach trip to the insane, such as paragliding while trying to hook jetpacks to the six children before they splatter on the ground. There are light story elements involving you as the parent being put before a trial due to child endangerment, and the story see’s your character go through out-of-control scenarios in order to persuade the jury that you were really just trying to just be a good parent. There are different goals for each stage, with the first few having you try and last through a timer with as many kids alive as possible, and later stages having you perform certain steps before a timer reaches the end. Extra points are then given for completing certain objectives in between saving the children from peril. These range from setting tables and cooking burgers, to protecting grandpa from severe sunburn (because an old man is unable to care for himself on a beach I guess?). You are ranked after each level on an A-F grading scale and to say this title is extremely difficult is an understatement. I understand that the pitch for Think of the Children is novel: trying to be the best parent with as few dead kids as possible, but it’s the nonchalant way it will casually have kids be abducted off the yard, drown in a pool, or killed by a jellyfish that, in a way, irked me. Maybe it’s because I have three children of my own and they never behave this badly, that once the unique concept wore off it became practice in tedium, more than an enjoyable affair. The gameplay is very tedious because no matter what you try to do you never have control of the situation, which is made worse if you try and play Think of the Children solo. I enjoy dark and borderline offensive humor as much as the next person, but with Think of the Children being chaotic for the sake of it, there never came a time where it was an enjoyable experience. I had fun for a few rounds learning the concept and the crazy ways the children can die with their little ghosts flying into the sky upon death. But, I found myself just getting frustrated at how much you have to do at any one time. Playing a few rounds with my oldest kids made the experience more enjoyable and even humorous at first, but even they became tired of the gameplay and, if anything, maybe I convinced them that being a parent isn’t always what its made out to be. An example of a successful chaotic co-operative multiplayer title that gets it right is the aforementioned Overcooked, which knew how to pace its challenges well. It also had strategic elements in each level where each player could assign themselves different roles in order to make food orders more efficiently. With Think of the Children, all of the strategy gets thrown out in a total ADD rush of just continuously trying to save the children. There are unlockables that can be earned by finishing with a high grade which range from a new outfit or hat, but they are all only cosmetic. It also doesn’t give much respect to its subject matter, being the actual children. The children you’re trying to save become the enemy, and after so many attempts of trying to stop Jimmy from eating poison berries, he will immediately beeline straight for the fire on the grill to try and burn himself. With these kids doing their best at trying to kill themselves there’s really no way to keep them safe, which makes the objectives practically meaningless and ultimately undermines the gameplay in general. Whereas in Overcooked your objectives were always achievable and with some skill, you could overcome unlucky gameplay hurdles like moving kitchen trucks or mobile sci-fi kitchen stations. With no real message or sense of achievement, Think of the Children’s whole concept falls over itself. It would have been nice to see some type of grace period implemented where a kid you’re handling will at least behave themselves for even just a little bit. Even the ways to keep them occupied by buying ice cream or setting up a sand castle for them to play with, end far too quickly or don’t work at all. Setting up the tables and then putting one or two down for more than a few seconds, or using the shout ability to have kids nearby follow you for a few seconds would have drastically made the game more bearable. Overall, Think of the Children will probably be a novelty type of party game where you and your friends will have fun for a few minutes, but then move along to something else. I can’t recommend anyone picking this game up solely as a solo experience, as it was meant to be a co-operative title and it shows with just how hard the gameplay is.